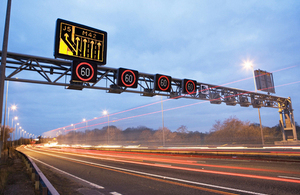 Overnight essential maintenance on the M4 Second Severn Crossing will take place over the next two weekends. The work includes bridge joints and lighting maintenance, along with safety barrier inspections. A closure of the eastbound carriageway will be required between 8pm on Saturday November 8 and 6am on Sunday November 9. A westbound closure will then take place between 8pm on Saturday, November 15 and 6am on Sunday, November 16. We have planned the work carefully to cause the least possible disruption to road users and will also be taking the opportunity during the closures to carry out other work such as carriageway sweeping and central reserve grass cutting to reduce the need for traffic management in the future. Road users will be advised by diversion signs to use the M48 Severn Bridge, adding 1 mile to the journey for those heading for Bristol, London and the Midlands and 9 miles for those heading for the South West. 6 November 2014 A closure of the eastbound carriageway will be required between 8pm on Saturday, November 8 and 6am on Sunday November 9. 5 November 2014 First published.